Professional members of staff are available to advise on a large array of property related matters. Our professional team are members of the Royal Institution of Chartered Surveyors and/or members of the Central Association of Agricultural Valuers which makes them hugely experienced and qualified to carry out the work. Staff are required to conform to the various codes of conduct and rules and regulations provided. Jefferys Estate Agents in Liskeard, Lostwithiel and St Austell are a long established independent Cornish firm selling property throughout Cornwall with over a century of local knowledge and experience. We have our finger on the pulse of the local market with the strength of National Coverage. Most of our team of experienced sales staff are members of the National Association of Estate Agents and are regulated and bound by their rules. We offer a FREE no obligation market valuation. Please contact us or complete our on-line form and we will be in touch without delay. If you are thinking of selling your property or just need some property advice talk to our team of professionals who would be pleased to discuss your requirements in confidence and without obligation. Jefferys are expanding their commercial sales section. We are now selling and managing more commercial property than ever before. Jefferys are frequent advertisers on specialist commercial websites and have a diverse portfolio of property both for sale and for rent. As well as selling and letting commercial properties, Jefferys can offer a fully managed service where we can take care of every aspect of the process. Search our database of commercial property using our search facility. Jefferys have been serving the Cornish farming community since 1865. With frequent sales of farms and land, Jefferys are able to provide farmers with a complete professional and experienced service. John Blake and David Maskell are Fellows of the Association of Agricultural Valuers. Having been involved in all agricultural matters throughout their working careers, they are well placed to advise on all farm and land issues. Jefferys regularly deal with sales of farms and land whether it be a small paddock or a large commercial farm. For more advice or a free market appraisal please contact one of our offices. Search our database of farms and land for sale using our search facility. Jefferys Letting Agents in Liskeard, Lostwithiel and St Austell have an experienced team who specialise in property management and the lettings market. With their wealth of knowledge they are able to advise landlords on the letting and management of their properties and compliance with the current legislations. In addition to having experienced staff, we are bound by the Rules of Conduct of The Royal Institution of Chartered Surveyors(RICS) and the National Association of Estate Agents(NAEA), as well as being members of The National Approved Letting Scheme (NALS). At Jefferys, we aim to provide a professional service with honesty and integrity, at a competitive price. We are the link between landlords and tenants, qualified and experienced to know how to deal with any issues that arise effectively and efficiently. The residential management team is supported by our property management accounts department. We pride ourselves on giving a personal and professional service. We believe that good communications with residents and clients is vital to the smooth running of the properties we manage, creating trust that all issues will be dealt with expeditiously. With over 150 years in the business we have built up a varied client base. Many clients are single property owners whilst others have large portfolios. We also act for landlords in the collection of ground rents. We pride ourselves on providing a personal, professional service to ALL our clients. In order to process the application and obtain the necessary credit references, we will require a payment of £75.00 per applicant over the age of eighteen. At the beginning of a tenancy, a deposit will be required (equivalent to six weeks rent unless stated otherwise), together with one months’ rent in advance. 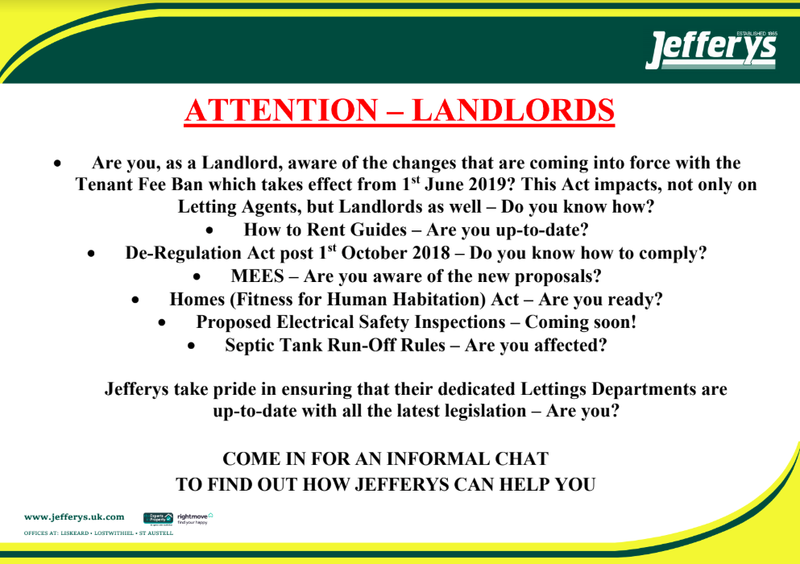 Please note that when Jefferys work under a Tenant Find Only service, any dispute that arises between Landlord and Tenant during the tenancy or after vacation and work is undertaken, a fee will be charged. A further fee of £50.00 is chargeable to re-register the deposit after the first 6 months of tenancy and annually thereafter. Jefferys Estate Agents in Liskeard, Lostwithiel and St Austell offer a property management service in respect of commercial property. We currently handle a mixed portfolio which includes shops, offices, factories and warehouses. It is important that landlords maintain their properties to a high standard in order to achieve good rents and attract quality tenants. Presentation is very important in the initial stage of finding a tenant. We recommend that the property is in good decorative condition; the property is professionally cleaned including carpets, chimneys and ovens etc. Jefferys have a panel of suitably qualified contractors who will be able to provide safety checks along with any repairs or maintenance that may be necessary. Landlords will be given prior notification of the works wherever possible. All gas appliances must be checked annually by a Gas Safe registered engineer. The tenants must have a copy of a valid Gas Safety Record. At present there is not any legal obligation for a landlord to obtain an electrical test for fixed wire installation. However, the landlord is responsible for the health and wellbeing of his tenants. Jefferys and the RICS therefore advise landlords to carry out regular electrical tests to ensure the safety of the installation. Every five years and at the beginning of a new tenancy is normal practice. Landlords should ideally remove electrical appliances from the property. Any appliances left in the property will need to be PAT tested annually. Legislation enforces that all soft furnishings, upholstery or upholstered furnishings must conform and be fire retardant to the appropriate standards. We therefore recommend that landlords remove all furnishings from the property. All properties must be fitted with a smoke alarm and carbon monoxide detector where applicable. EPC’s are a legal requirement for all rented properties let after 2008. Our domestic energy assessor is on hand to provide this service for you. The Certificates are valid for 10 years and will provide both landlord and tenant with recommendations that they can implement to reduce energy bills. Income from rented properties is taxable. Emigrated landlords are required to have tax deducted at the basic rate unless advised differently from HM Revenue & Customs. New tenants must sign the AST agreement prior to moving in. Our agreements are normally six month agreements and then become ‘periodic’ thereafter. The agreement will explain the full terms and conditions that apply to the tenant and landlord. A reference application is completed by all applicants who wish to rent a property. The referencing form will include employment details, credit checks and previous tenancy history. There will be a small non refundable fee to be paid by the applicant. All viewings must be booked through the appropriate office. Viewings will be accompanied by a member of staff. In order to conform to the Tenancy Deposit Scheme, a comprehensive inventory is produced. This document will give a photographic record of the property and pays specific attention to condition, colour of walls & carpets and identifies any immediate defects etc. As part of our management contract we carry out regular inspections. These inspections will give the landlord a written and photographic report of the current condition of the property and will identify any problems/issues that require attention. Landlords are required to get written consent from their mortgage provider before letting the property. Landlords must have appropriate buildings insurance. The tenants are responsible to pay the council tax for the property along with the utility bills. Any exceptions to this which will be stated in the tenancy agreement. As part of our service we carry out regular inspections. As tenants you are expected to co-operate. These inspections will give the landlord a photographic report of the current condition of the property and will identify any problems/issues that require attention. We recommend that tenants insure their contents of the property along with any landlord fixtures and fittings. Jefferys Auctions offer a complete Auctioneering and Valuations service throughout Cornwall. Centrally located in the Ancient Stannary town of Lostwithiel, the Auction Rooms, Lostwithiel are the focal point of the company. Headed by the Managing Partner Ian Morris, Jefferys Auctions hold bi-monthly Antique & Selected Sales interspersed with fortnightly sales of Antique & Modern Furniture & Effects. For the collectors there are also bi-monthly auctions of Coins, Stamps, Militaria & Collectors items. Other regular sales held away from the Auction Rooms include Poultry and Machinery Sales at the Royal Cornwall Showground, Wadebridge and we hold an annual Auction of Collective Machinery at Sticker, St Austell. Click here to visit our Jefferys Auctions website.